It was March 1967. Poor farmers armed with lathis, bows and arrows raided the paddy granaries of jotedars at Naxalbari, situated at the tri-junction of India, Nepal and Bangladesh (then, East Pakistan). These were small incidents but with far-reaching implications. The People’s Daily of China hailed these attacks as “a peal of spring thunder” and that “the Chinese people joyfully applaud this revolutionary storm of the Indian peasants”. The events were mainly shaped by Charu Mazumdar, Kanu Sanyal and Jangal Santhal. Charu was the brain behind the movement, Kanu the organiser, while Santhal mobilised the tribal santhal community. The movement was crushed by the police, but its sparks flew to distant parts of India. The Indian State could never imagine that the movement would spread across states and, at its peak, affect 200 districts in 20 states. The UPA government, on more than one occasion, described this Left-Wing Extremism (LWE) as the greatest threat to the internal security of the country. According to latest estimates, 104 districts in 13 states are affected by the Maoist movement. With 2017 marking the 50th anniversary of the Naxalite movement, security forces stationed in the so-called Red Corridor have sounded the alarm that recent attacks on security forces could signal the start of a resurgence of anti-state activity by the armed insurgents. On March 11, 12 personnel of the CRPF were killed by Maoists in Sukma of Chhattisgarh. The Maoists were able to decamp with six INSAS rifles, four AK-47 rifles, one 51 mm mortar and some other weapons and ammunition. The NDA government claims to be winning the war against the Maoists. It is true that there has been significant shrinkage in the total area affected by Maoist violence and that several members of the party’s central committee and politburo have been neutralised. Last year, however, witnessed a considerable escalation in Maoist depredations. There were a total of 433 fatalities in 2016 as against 251 in 2015. What is worrying is that the proportion of security forces personnel killed to that of Maoists has dropped from 1:3.7 in 2016 to 1:1.55 in 2017 (to date). India’s home minister Rajnath Singh recently claimed that the Maoist threat would be eliminated in the next five years. It is true that the military capability of the Maoists has been seriously dented, but let’s not be too optimistic. If we take a historical overview of the Naxalite/Maoist movement, we find that twice in the past, governments believed that they had knocked out LWE but they managed a comeback. After the arrest of Charu Mazumdar in 1972 and the subsequent differences within the party, it was thought that the movement had run out of steam. However, it revived in 1980 with the formation of the People’s War Group (PWG) by Kondapalli Seetharamaiah. Effective counter-insurgency operations however decimated the PWG. Seetharamaiah was arrested. Again, the government thought the movement had been vanquished. However, in 2004, the movement resurrected in its third avatar when its two major components – the People’s War and the Maoist Communist Centre – merged to form the Communist Party of India (Maoist). It was declared that the objective of the party was to “carry on and complete the already ongoing and advancing New Democratic Revolution in India as part of world proletarian revolution by overthrowing the semi-colonial, semi-feudal system.” The guerrilla outfits were reorganised as People’s Liberation Guerrilla Army, which is about 6,000 strong. The movement keeps on reappearing like a phoenix because the basic socio-economic factors, which are responsible for it, remain unaddressed. Poverty continues to be a problem and, according to the expert group headed by C Rangarajan, 29.5% of the population lived below the poverty line in 2011-12. Wealth is increasing, but its distribution is unequal. About 1% of the rich are said to own 58% of the country’s wealth. Unemployment is another area of concern. Land reforms have been forgotten. Tribals are an alienated lot, largely due to their displacement as a result of developmental activities in the forest areas. The state police forces unfortunately lean heavily on the shoulders of the Central Armed Police Forces. The great lesson of Punjab is that until the state police take the terrorists/extremists head-on, the battle against terrorism/extremism will never be won. Other forces can play only a supporting role. The state police are today in a shambles. It is also disconcerting that the successes of the security forces are not followed up by the administration. Government departments do not establish themselves in areas when the Maoists have been driven away. 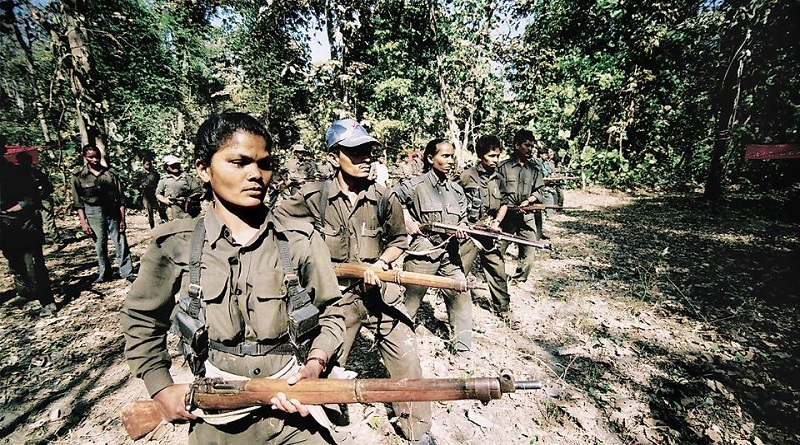 In course of time, Maoists fill the administrative vacuum and regain the lost ground. And so, the battle which started 50 years ago in Naxalbari goes on. It will continue to bleed the Indian State until we improve governance and address the core issues which sustain the movement. ← Against the American Intervention in Syria and imperialist war!